The Palermo 3 Over 4 Chest is a stunning piece of bedroom furniture. The beautiful chest is elegant and stylish, fit for a boudoir hotel. The Palermo 3 Over 4 Chest offers plenty of storage options without weighing down the room with unattractive, heavy furniture. 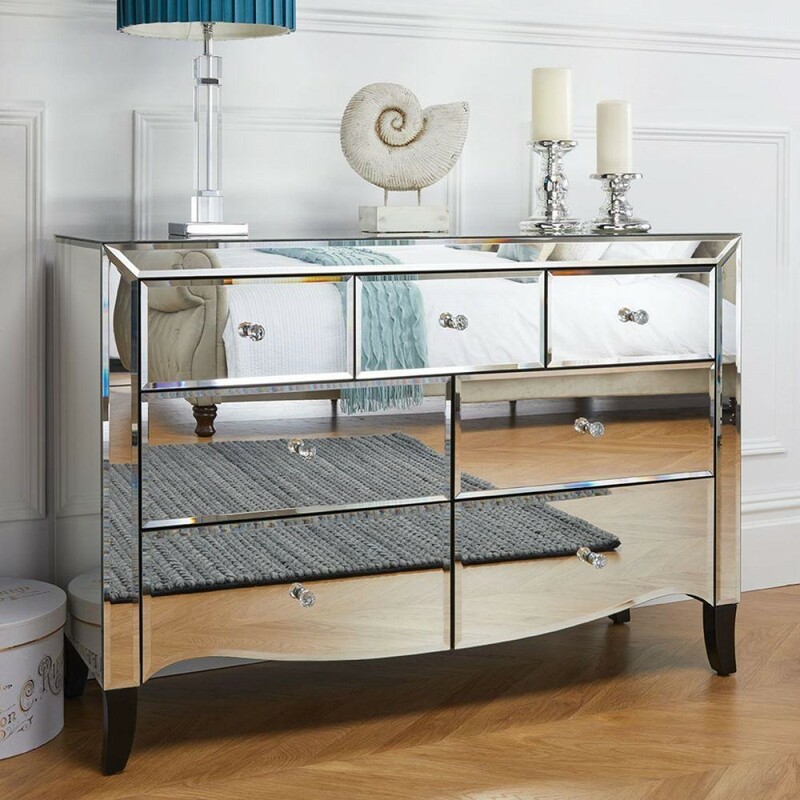 The surface is covered with a beautiful mirrored finish featuring elegant bevelled edges and mock crystal handles to access the drawers. There are 7 drawers in total, plenty of space to store your clothing and belongings! Keep your bedroom looking its best with the addition of the Palermo 3 Over 4 Chest. 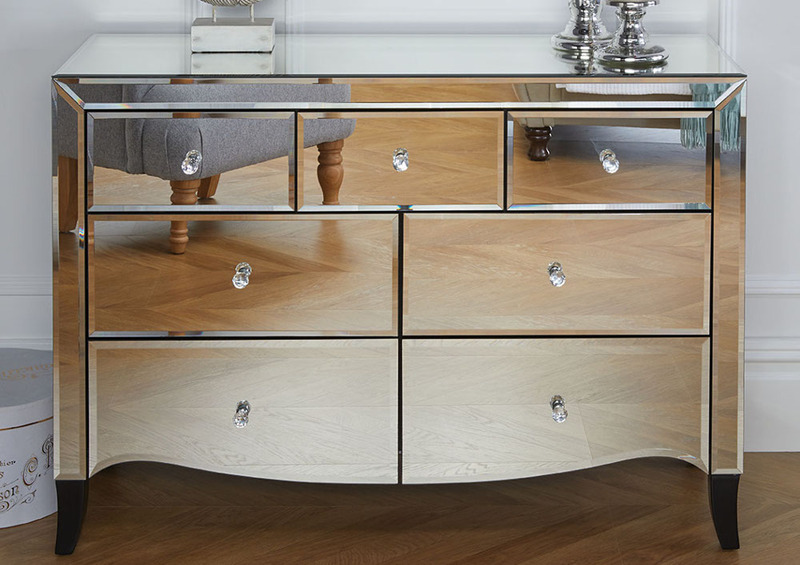 The top level of drawers features 3 equal sized drawers, each completed with the mirror finish and mock crystal handles. These drawers are perfect for storing smaller items, from intimates to beauty essentials. Beneath the first level of drawers are 2 more levels, each one boasting 2 drawers of equal size. Use the drawers to store your clothing, bedding or any other items are otherwise cluttering up your space. The Palermo 3 Over 4 Chest has a romantic vibe thanks to the stunning design and use of high quality materials. The chest arrives pre-assembled, no construction required. Place the Palermo 3 Over 4 Chest in your bedroom and begin using and enjoying this essential piece of furniture immediately. Only quality materials have been used throughout construction! The Palermo 3 Over 4 Chest is a beautiful and practical chest. Create a glamourous bedroom with a boudoir feel with the Palermo 3 Over 4 Chest. The Palermo 3 Over 4 Chest is part of the stunning Palermo Mirrored Bedroom Furniture Collection. Create an elegant bedroom fit by mixing and matching the other pieces from the Palermo range.